DREAM, DREAM: Andrew and Warren Williams bring their Everly Brothers tribute to Geelong next month. As the sons of an Aussie rock pioneer Warren and Andrew Williams have the music pedigree to pay tribute to The Everly Brothers. As kids they listened to the brothers with their dad Warren Williams (Sr), a regular performer on Australian TV. “We grew up with the music of that era going to rehearsals and watching dad sing,” Warren (Jr), 58, said. After decades perform together, The Williams Brothers bring their tribute show to Geelong Performing Arts Centre on 13 April. “We’re just very used to being on stage together,” Warren said. Warren first performed alongside dad at age six on iconic TV show Bandstand. Despite being ten years younger, Andrew also grew up listening to the music of the ’60s. “We were singing stuff with dad since we were little boys,” Warren said. 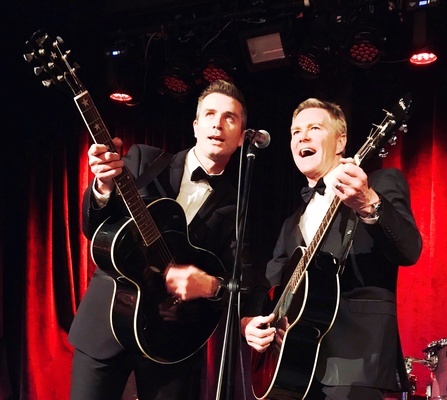 The first half of their show, which comes to Geelong for the first time, relives the story and music of The Everly Brothers. “It’s more like an Everly Brothers songbook – we don’t try to impersonate them,” Warren said. The second half of the show is a jukebox of rock hits, from Buddy Holly, Chuck Berry and Little Richard, to The Bee Gees, The Eagles and The Beatles. “We ask the audience what they want to hear,” he said. For decades the brothers had played tributes to artists from the ’50s to the early ’70s, Warren explained. “We basically know everything from those eras, so it’s pretty hard to stump us. The brothers will play with their band The Shy Guys, named after their father. “(The Shy Guy) was the nickname given to our dad by Johnny O’Keefe back in his glory days,” Warren said.